Christian Louboutin once said “Shoes transform your body language and attitude. 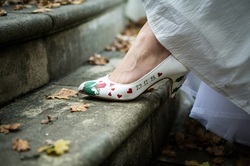 They lift you physically and emotionally” Well can you think of a more joyfully emotional romantic day than your wedding? 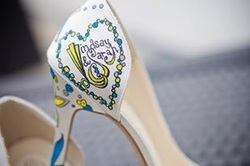 So it stands to reason that your shoes should be just that little bit special to carry you down the aisle on those steps that will probably be the most important and meaningful you ever take! 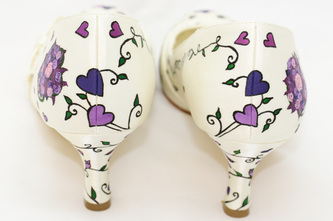 They’re not just wedding shoes, they’re YOUR wedding shoes, so whether you’re a lady that loves her heels or would prefer comfy flat wedding shoes, look no further, as hand painted shoes could be just what you need to create your dream bridal shoes. 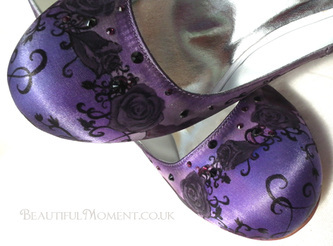 Beautiful Moment offer the most desirable designs to your exact specification, creating a unique piece of keepsake art to wear. 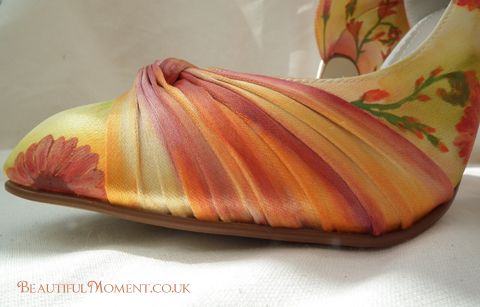 The process works by you first finding some shoes in which you feel comfortable. 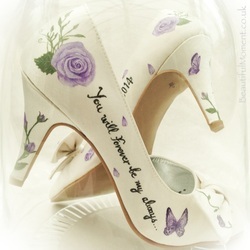 These can be high end boutique shoes, high street styles for under £30 or even an existing pair you may have, but by the time they have been painted they will be your own unique personalised designer shoes and nobody else in the world will have them! You can have as much or little input into your design as you like and will receive an emailed sketch for approval of bespoke designs before any painting takes place. Once finished your shoes are posted back to you in their own exclusive shoe carrier box by special delivery insured post. All orders are booked onto my calendar in advance but you do NOT need to have purchased your shoes first in order to book your slot. There are two main styles on offer, Ivory on Ivory, a beautiful delicate almost embroidered effect on satin which allows you to have personal detail and decoration whilst still retaining a traditional ivory wedding shoe look (with or without colour painted areas) and full colour, where you can add a splash or a whole bucket of colour and intricate detail! This style works particularly well with pastel tones or for vintage style weddings. 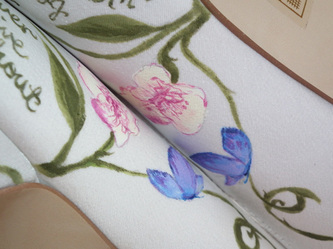 You can chose from the full bespoke service or an "off the peg" set design. All work is quoted on an individual basis using the online quote enquiry form or by email. 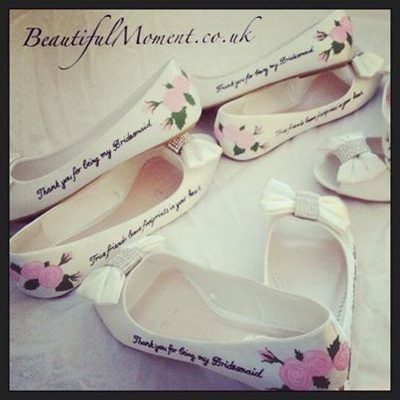 Special offers for multiple purchases (including bridesmaids) painted soles and dancing flats when purchased with main bridal shoes. 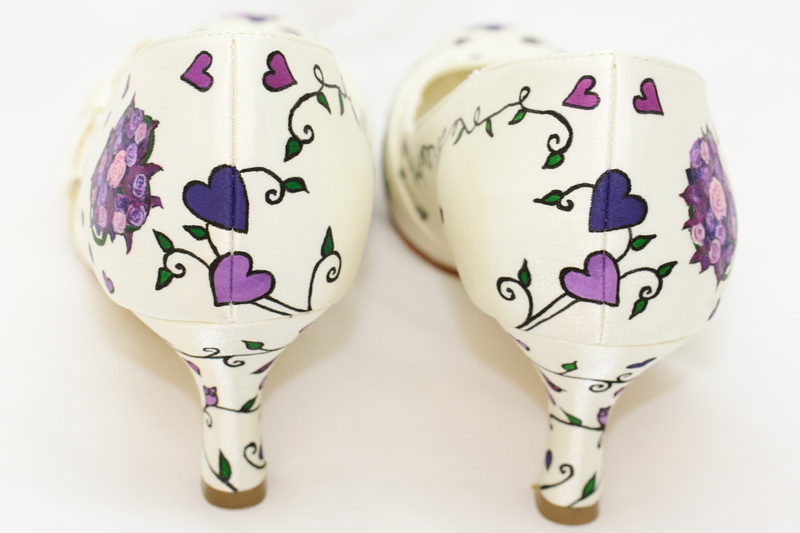 Please remember all artwork is done onto shoes that YOU buy first to ensure a perfect fit before customisation. I only do a few pairs per month to ensure the highest quality work and get booked up quickly so it is essential to book a slot on the calendar with a £50 deposit to guarantee your place and avoid disappointment. I need the shoes for approx 4-6 weeks and preferrably in advance of your final dress fitting if applicable but turnaround times can be quicker in certain circumstances. 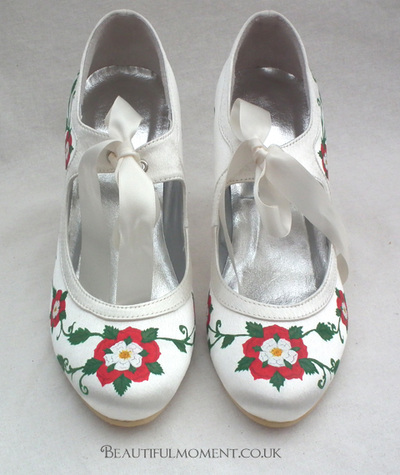 Heres just a few ways your shoes can be transformed!